This place so often mentioned, was first given up to the English fleet under Lord Sandwich, by the Portuguese, January 30th, 1662; and Lord Peterborough left governor, with a garrison. The greatest pains were afterwards taken to preserve the fortress, and a fine mole was constructed at a vast expense, to improve the harbour. At length, after immense sums of money had been wasted there, the House of Commons expressed a dislike to the management of the garrison, which they suspected to be a nursery for a popish army, and seemed disinclined to maintain it any longer. The king consequently, in 1683, sent Lord Dartmouth to bring home the troops, and destroy the works; which he performed so effectually, that it would puzzle all our engineers to restore the harbour. It were idle to speculate on the benefits which might have accrued to England, by its preservation and retention; Tangier fell into the hands of the Moors, its importance having ceased, with the demolition of the mole. Many curious views of Tangier were taken by Hollar, during its occupation by the English; and his drawings are preserved in the British Museum. Some have been engraved by himself; but the impressions are of considerable rarity.—B. History of the Garrison in Tangier. More on the Sandwich and Tangier. For those whose geography is as weak as mine: Tangiers is a coastal city in Morocco, located across the straits of Gibraltar from Spain. Its value was that, together with the fortress city of Gibraltar, it allowed control of access into and out of the Mediterranean. More on Sandwich and Tangier. “When Sandwich arrived he found the place besieged by Moorish troops under Gayland, who had rebelled against the Emperor of Morocco and was in the control of the region around Tangier. With commendable promptitude Sandwich landed seamen to man the derilict defences…. "Tangier: England's Lost Atlantic Outpost 1661-1684," Routh, E.M.G. London. John Murray. 1912 Huge amount of information about the whole period of the English occupation of Tanger. A lot from Peyps' journals and includes many plates of Hollar's engravings of the fortifications. The L&M Companion volume has a long essay on Tangier. "For over 20 years from 1661 to 1684, the ancient city of Tangier was held as a colony by England. The story of the occupation now constitutes, at best, an obscure footnote in Britain’s imperial history. And yet, in its day, the English presence in Tangier represented the greatest overseas investment of royal manpower and resources..."
On May 3rd 1663 Lord Peterborough was enticed by Guyland to let the garrison outside the city walls. They ran out “in a confused manner”, without prior knowledge of the strength or position of the Moors. The result was disaster. The British pursued the retreating Moors who led them into a prepared trap. Surrounded on three sides the British were routed and only a third of force regained the safety of the town. This serious setback sapped the confidence of Peterborough and his garrison. No parties were sent out of the town and the gates were permanently shut; the Moors were permitted to steal cattle from under the very noses of the sentries. A change of command was required. 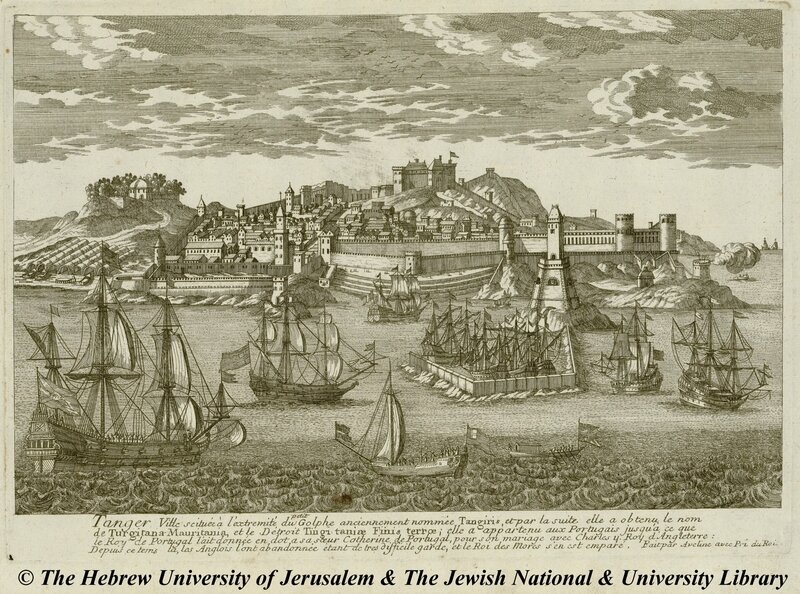 Teviot arrived on the 11th May 1663 and realized that the key to a successful defence of Tangier lay in the construction of fortifications which would allow the Garrison and not the Moors to control the circle of hills surrounding the town. On June 19th the Moors attacked Fort Catherine, 300 yards in advance of the main gate, but were beaten off. Six days later the Moors launched an offensive against the unfinished Pole Fort, and again the assault failed. After this defeat Guyland sued for 6 months peace, and Teviot accepted as it gave time to complete to fortifications. The Moors paid scant regard to the truce and attacked the new redoubt, but were driven off. On 16th July came decisive action. Teviot employed a “Guard of Dogs” to discover Moors hiding within the British Lines, and a 2.00 pm they found enemy horsemen waiting in ambush. The Tangier Horse charged down on the Moors, but Teviot fell back as he spotted the approach of a large body of enemy infantry. The 5 new forts were ordered to be manned. A mist had blown in from the sea and the Moors set fire to the grass before Tangier, blinding the garrison artillery. Under cover of this smoke screen, the Moors advanced within a musket shot of the forts. Then, as if through divine intervention the winds changed direction blowing the smoke back over the Moors. This was too much for Guyland who he again asked for a truce. On the 4th of September Dirk shows that Fanshawe returns to England from his role in Portugal. The Spanish still believe that Tangier is their property, being at war with Portugal and not recognising Portugal to be an independent State. The Spanish could only take Tangier with the help of Guyland attacking on land, while they mount a sea attack. Philip IV tries to negotiate with Guyland, and English intelligence gets wind of this. Fanshawe is chosen to go Madrid as Ambassador with instructions to diplomatically warn Philip that we are aware of plans without flaunting all his knowledge. However Guyland had no intention of helping the Spanish and was only interested in taking the money and playing at diplomacy. Mr. Gauden, Victualler of the Navy, supplied the garrison in Tangier. After repulsing the first attack, Teviot was sufficiently confident to advance further inland... but he was moving into a trap. The Moor's first attack had been a decoy luring the British into a heavy wooded upland where another 8000 lay hidden. Unable to assume their stylised order of battle, the British were defeated in clusters of hand to hand fighting where pikes and hangers were no match for scimitars. Teviot rallied his battalion at the summit of Jews Hill where they were cut down to a man. 30 out of the original 500 escaped to Tangier. Michael, thanks for the picture. The Mole that we've read so much about is the long straight breakwater extending out into the sea just to the right of the towered building that is the most prominent feature in the garrison. If you zoom in on the picture you can see a line of ships heading for (or away from) it. Far left could be Peterborough Tower. Far right as the walls fall down to Tangier Bay could be Irish Battery, near which, and inside, is situated The Market. In the centre towards the sea and to the left could be the Governor’s House, and to the right York Castle which is near the Parade Ground. The point jutting out opposite York Castle could be Catherina Point. Landward side from Catherina Point there are three buildings that could be from left to right, Bridges Fort, Pole Fort (centre) and Bellaise Fort. The path down the left from the forts leads to Whitehall, and further on and just out of the picture above Peterborough Tower would be Whitby! The Mole runs out to sea from below York Castle. Following the coast a short distance to the left and onward from Peterborough Tower would bring you to higher ground and a large fort called Whitby. The same distance further on is one called Devil’s Drop. There is then the narrow Great Valley running perpendicular to the coast with higher ground on the other side and called Teviot (Jews) Hill. Along this valley runs Jew’s River. On the Garrison side of the valley and opposite Jew’s Hill, moving inland from Devil’s Drop are Henrietta Fort and Charles Fort. Below Charles Fort in the valley is a bridge crossing the river. It was in this area that Teviot came to grief. Spoiler -- The Dankerts view is almost certainly the one SP saw at Whitehall on May 29th. 1669 " ... Here with Sir Charles Herbert and my Lord Hinchinbroke and Sidney, we looked upon the picture of Tangier designed by Charles Herberd and drawn by Dancre, which my lord Sandwich admires, as being the truest picture that he ever saw in his life - and it is endeed very pretty, and I will be at the cost of having one of them." There was also a version (? copy) commissioned by Sandwich (with a companion landscape of Plymouth) formerly at Hinchinbroke, also signed and dated 1669. See Oliver Millar 'Tudor, Stuart, and early Georgian Pictures in the collection of H. M. The Queen' 1963. no. 401; Margaret Whinney and Oliver Millar 'English Art 1625-1714, Oxford History of English Art VIII' 1957. pp. 263-4. "Dinner not being presently ready I spent some time myself and shewed them a map of Tangier left this morning at my house by Creed, cut by our order, the Commissioners, and drawn by Jonas Moore, which is very pleasant, and I purpose to have it finely set out and hung up." Can not find a reproduction on line, L&M record a copy in the BM [now BL] Topographical collection (K. Top. cxvii, III, TAB); the BM print department copy, BM Reg # Ee,2.130; location British XVIIc Unmounted Portfolio. Pennington, Richard, 'A descriptive catalogue of the etched work of Wenceslaus Hollar,' 1982, #1202. Hollstein, Dutch, XLII, pp. 123 - 36, 73. A NEW Map of Tangier, six Foot long and four Foot deep; a fit size for Chimney pieces, Galleries, or Staircases. It contains twenty-two several Draughts, with the Mold, Forts, and Lines, taken on the place by Robert Thacker, Designer to the King, for His Majesties particular Use; and now published for the Satisfaction of such Nobility and Gentry as are curious to know the present State and Condition of the place to this year 1681: together with printed Explanations, and a History of things remarkable from its Original to this time. Price, with Ledges and Roller, 20s. Sold by R.Clavell at the Peacock in St.Paul’s Churchyard. The only other contemporary view of Tangier, 'Four views ...' (A Prospect of Tangier and the Mole before it was Demolished..., ... Tangier; A Prospect of Tangier coming firm the Westward before it was demolished, ... after it was demolished), engraved by Nicholas Yeates and John Collins after Ensign Thomas Phillips who traveled with SP in 1683-4 expedition and performed the demolition. There appear to be a unique set of survivals, Knighton describes them as printed on double sheets and hand colored (examining the published plates only and not the originals, to me these appear to be the original set of pen and watercolor drawings), in the Pepys Library, PL2895, pt. ii., 294 -307, reproduced in C. S. Knighton ed. 'Pepys Later Diaries,' 2004 (paper 2006) (unnumbered, but color plate II-V in my copy). Knighton notes the set as unique. They were advertised at the time as 'for sale,' London Gazette 5-8 Jan 1685, #1997, if actually published and copies survive I can not find impressions in the British Museum Collection or elsewhere. There are some of Phillips unpublished papers, and drawings, relating to Tangier at Worcester College, Oxford. This place, so often mentioned, was first given up to the English fleet under Lord Sandwich, by the Portuguese, January 30th, 1662; and Lord Peterborough left governor, with a garrison. The greatest pains were afterwards taken to preserve the fortress, and a fine mole was constructed at a vast expense, to improve the harbour. At length, after immense sums of money had been wasted there, the House of Commons expressed a dislike to the management of the garrison, which they suspected to be a nursery for a popish army, and seemed disinclined to maintain it any longer. The king consequently, in 1683, sent Lord Dartmouth to bring home the troops, and destroy the works; which he performed so effectually, that it would puzzle all our engineers to restore the harbour. It were idle to speculate on the benefits which might have accrued to England, by its preservation and retention; Tangier fell into the hands of the Moors, its importance having ceased with the demolition of the mole. Many curious views of Tangier were taken by Hollar, during its occupation by the English; and his drawings are preserved in the British Museum. Some have been engraved by himself; but the impressions are of considerable rarity. — B.